Q. I'm not Instagram user. Can I use InstaBG? Even if you don't have Instagram ID, you can set InstaBG to your Twitter account by using everyone's photos in Instagram. Q. I set InstaBG to my Twitter account. Sometimes, my background is quickly shown before I open other Twitter pages. It is not an error. It is just a behavior of Twitter API. It calls user's setting first, then contents. Q. When does "Auto update" work everyday? 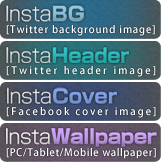 It will be set to the time when you saved InstaBG to your Twitter account. Q. I entered my InstagramID and clicked "Preview" button. I got an error and my preview image was not shown. Q. I set InstaBG, but photos were not reflected to my Twitter. There are possibilities that Twitter API is not responsing for your ID. Twitter has a lot of servers, and the server which serves API for your ID may be down or something. You may try to logout from InstaBG and then login & set background again. If it doesn't work, please try later. Q. How can I remove InstaBG background? 1. Delete "InstaBG" App from "Applications" in Twitter setting. 2. Select another design from "Design" in Twitter setting.